I find the details of steampunk irresistible; if they’re done well, I overlook deficiencies of plot or character development. 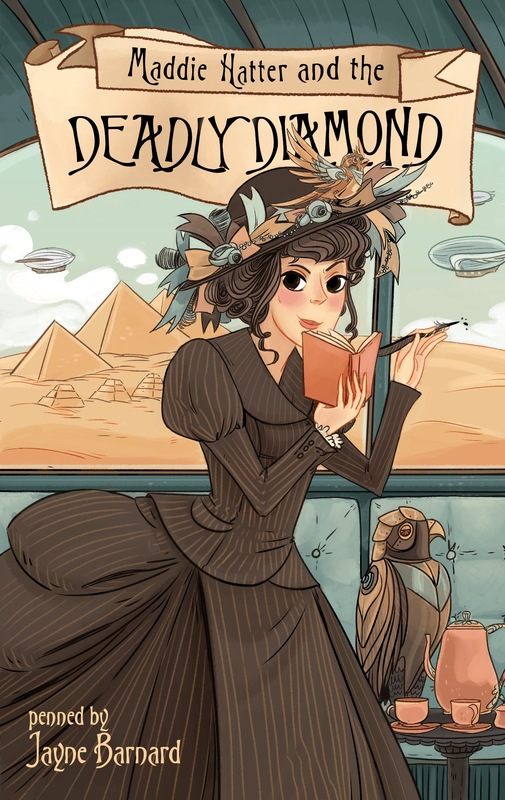 So imagine my delight at a fun steampunk novel that also provides a memorable heroine and an absorbing mystery AND is surely the start of a series. Maddie Hatter is the alter ego of Madeleine Main-Bearing, wealthy daughter of a Steamlord. Maddie is a fashion writer in Egypt hoping for a story that will give her more meaningful reporting jobs than what gloves the ladies in Cairo are wearing, when her potential big break falls from the skies–Baron Bodmin has disappeared while seeking the Eye of Africa, a priceless diamond. If Maddie can find either the baron or the diamond, her career will skyrocket. But when the mystery leads her back to England, she has to tread carefully–revealing her identity would incur her powerful father’s wrath. The steampunk world Barnard has created is rich in detail. Maddie’s clockwork bird in particular is inspired, and even steals a scene or two. There are nods to Agatha Christie, Clue, and Indiana Jones (and Alice in Wonderland, of course), which add to the fun. Maddie is an engaging heroine, and her decision to abandon her birthright in favor of adventure and a career makes her a sympathetic one. She’s smart and capable, but asks for help when she needs it. There are plenty of clues and red herrings to keep Maddie and the reader guessing until the end. A throughly enjoyable steampunk mystery. Source disclosure: I purchased this e-book.